The Mississippi River Ship Channel could be the first port complex on the Gulf Coast to reach a depth of 50 feet now that the Director’s Report has been signed by the U.S. Army Corps of Engineers. Elected officials and industry leaders have long worked to increase the channel’s depth to 50 feet, which is the same depth of the expanded Panama Canal. In signing the Report, Corps of Engineers Director of Civil Works James C. Dalton stated the project is “economically justified and environmentally sustainable” and recommended approval of funding for the project. The project will provide a draft of 50-feet from the Gulf of Mexico upriver 256 miles to the Port of Greater Baton Rouge. In addition, the material dredged from thirty miles of the project near the Mouth of the Mississippi River will be used to create an estimated 1,462 acres of new marsh habitat. In accordance with cost sharing provisions of Section 101 of the Water Resources Development Act the federal share of the project would be $118.1 million, while the estimated non-federal share would be $39.4 million. The current ship channel is maintained to 45 feet. The Corps’ report identified the benefit-to-cost ratio at 7.2 to 1, calling the project one of national and international significance. 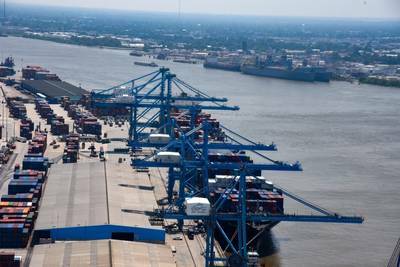 “Louisiana is our nation’s gateway to the world for commerce, so it is vitally important we continue to be globally competitive in shipping capacity. Deepening the Mississippi River Ship Channel is very important for Louisiana, and is also strategically important to the nation as a whole. I have consistently fought to move this project forward in Congress, and I will continue working with my colleagues to make sure it is funded as soon as possible,” said House Majority Whip Steve Scalise.